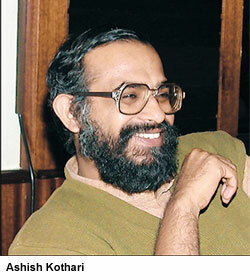 Next in our series of interviews is Ashish Kothari, co-founder and member of Kalpavriksh, catalyst of the network Vikalp Sangam, and co-author with Aseem Srivastava of the book “Churning the Earth: The Making of Global India”. Before the interview starts we talk about a poem[i] from Gabriele Dietrich, National Convener of NAPM. “To know what we know” seems to be a big challenge social movements and grass-root communities should pick up in the political context today. Let’s try to understand what environmentalists and social activists “know” in India today, after many decades of struggles. We just had the convention of NAPM in Pune, where future challenges have been identified and discussed. From your long experience in this field in the country, would you like to comment on the trajectory of the environmentalist agenda in India in the past few decades? Ashish: Social movements in India have a long story, well beyond the founding of NAPM. And with social movements here I include also environmentalist movements who understand the environment as a lived space, as a livelihood space. Especially in the last three or four decades, the environmental focus has become much more central to the movements. One of the reasons is that the forces of both colonialism and post-colonialism take over common spaces like forests, water bodies, etc. They get more and more widespread and aggressive, and the commercial use of these commons also increases. Also, we may see a slow decline in the pure conservationist kind of environmentalist agenda. The convergence is growing between movements focused on ecological protection and those concerned with human rights issues and social justice. And this is happening especially at the grassroots level, as there you can’t separate the two aspects. NAPM has played an important role in this convergence as it helped to make people understand those are common struggles. Nevertheless, I think other convergences have unfortunately happened much later and are still quite weak. Movements against communalism and casteism, feminists, dalits and workers (especially belonging to the informal sector) have only recently engaged in a dialogue with social movements focused on natural resources based livelihoods. Fishing communities are maybe the ones where this last convergence is more evident. And it is slowly reaching out to some agricultural and industrial workers. You can see for example the New Trade Union Initiative; which has a precedence in the case of Chattisgarh Mines Mazdoor Sangh, initiated by Shankar Guha Niyogi. We can see a convergence among groups affected by neoliberal reforms, those suffering communalist and casteist discrimination and those affected by the destruction of their livelihood sources and acquisition of land. Yet, there’s still lots of historical mistrust, like the one between grassroots communities and orthodox conservationists. This represents a great challenge for an alliance of movements wanting to expand and talk to more groups, and to become truly national in scope. For sure the most promising aspect is the fact that today, more and more groups are coming together not on a sole basis of common threat or condition, such as for example the loss of land or affected livelihoods. They are looking somehow beyond the impacts. Affected communities are therefore coming together with other social groups that questions the overall paradigm, that advocate for another model, a systemic change for an other world vision. Alliance is a nice word but entails problematic decisions which might become tricky sometimes, for example if you see the well-known green-saffron kind of environmentalism [purely conservationists and hindu-fundumentalist] in India. What do you think are the most problematic aspects of this expansion of alliances in the NAPM and, more broadly, in the socio-environmental movements in India? True, there are situations where it’s very difficult to ally with somebody. Look for example at some farmers unions or associations. You might agree with them on certain things like being anti-GMOs but you can’t stay with them when it comes to communalist politics (see the anti-Monsanto campaign and the hindu right wing Bharat Kisan Union in Northern India for example). Many of these farmers’ associations have been actually set up by the right wing but it’s not always easy to understand whom they belong to, there are so many! Other schemes like some renewable energy programs or the Clean Ganga scheme come from the right wing and apparently they look fine. You can say, fine, it could be an opportunity, let’s do something good for the environment and you can surely have very good intentions. But the larger message coming from the project proponents is completely opposite to yours. So, NAPM has to be very careful with whom it builds alliances. Localisation and self reliance are at the core of the economic vision right wing groups foster. Interesting enough it is also at core of Mahatma Gandhi’s philosophy and also of the degrowth vision. Do you find that contradictory? One has to look at the thin line between localisation as a radical force and as a regressive force. And also how you define the outsiders; the right wing here would define Muslims as outsiders. The dilemma for us for example is: shall we then use the same language as theirs and reclaim that language, that discourse? Or shall we find out a different language? I think we should reclaim a language that in its origins was progressive or neutral. See for example the word “radical” that we use in the frame of “radical ecological democracy”. Many say radical means extreme and I need to explain that it actually means going to the roots. So, in some cases we would need to re-imagine the word, while in other cases it’s maybe easier to reclaim if its cooptation is more recent. Like the concept of “buen vivir” coopted by governments in Latin America. Re-define, re-signify, re-imagine, depending also on the distortion and cooptation that happened. The word “development” etymologically is the contrary of envelopment, so it means opening up. And opening up opportunities for human beings is good, so in this case we should reclaim the word. But as historically it has got such a distorted meaning, maybe we should find new concepts, alternatives to development. Some help in this reasoning might come from the Commons as well. We can define three regimes: enclosures, opens and commons. While enclosures are imposed top-down and opens are not regulated, commons entail social bonds, they entail a community, and rules decided within that community often (but not always) in a non-repressive way. And these have to be respected, otherwise the commons cannot exist. That would not be a human society anymore if we did not behave in a collective manner; see the Ubuntu principle for example “I am because you are”, the two of us make each other, extended to the community or to humanity as a whole. This will necessarily also entail some bounds, some norms, that will have to be followed. Coming back to the idea of localism, I think for basic needs we need to relocalise and the scale should be defined by local socio-economic contexts. But, trade in other materials, exchange in people and cultures, ideas needs to be open. The more secure you are in your basic needs, the more secure you are in dealing with somebody else and not being scared. Gandhi said something like “I want the windows and doors of my house to be open to all cultures that flow through it, but I refuse to get wiped off my feet by any of those winds”. This can maybe be understood as open localism. “No struggle can be successful without a constructive vision of society” reads one of the articles in the special issue of NAPM Magazine. You have now proposed a collaboration with NAPM and the Vikalp Sangam, a network of alternatives and alternative projects in the country. Opposing something is not sufficient then, you have to show something different is possible and already happening. How do you see the dialectic between resistance and counterproposals? You know, the problem is that sometimes we try to find answers in a context where we are forced into compromises. Construction of alternatives is something that maybe NAPM has been weak at. This is not to blame anyone, it’s just that daily struggles are so intense that you don’t actually have the time, space, energy to work on a different vision of the society in concrete terms (of course the major principles of social justice, equity etc are there). But I truly think that a dialogue between grassroots communities and practitioners, academics, thinkers or what we call “intellectuals” (although I think everybody is an intellectual) can be very fruitful but it hasn’t taken up as a central challenge in NAPM, so I’m happy they have accepted this proposal. We need to learn from the boldness of the communities that have to resist the bulldozers of development, to get the same boldness to foster different visions of the society. So, in some cases you just have communities reclaiming what they had before: stop mining in forest areas and recover the living conditions they had before. And that is perfectly legitimate and understandable. But in some other cases, what communities want is transformation because a mess has already been created. Reconstruction both from the good that was lost and from new ideas and visions, this is what we absolutely need to do. We need to do it both for learning what we want next and put it in practice, but also to get public support because the common person out in the street asks for that. Actually when you work in struggling communities and sit with somebody and talk a bit longer, that is where the most brilliant insights and ideas come up. But yes, during an action or a resistance it’s hard to find time and space to let that discourse, that vision emerge. So it’s the responsibility of those who have that time and space to bring it out, write and disseminate it. Or even better, provide a platform where everybody can let one’s thoughts emerge. This is what I want to do for example next month when I’ll head to Orissa and talk with the Dongria Kondh in the Niyamgiri Hills about their visions during and after the victory to stop Vedanta mining projects. Working on alternatives is not a luxury, it’s a necessity. Are you somehow launching a warm invitation to scholars and researchers here? Yes, definitely. Academics who don’t engage with real life and grassroots levels (which of course do not need to be in ‘remote’ areas but also in your own neighborhood or in a city slum) are losing the opportunity and responsibility of being relevant to those in society who most need facilitation and help, the poor. You find so many top down esoteric research where academics do not engage with the people experiencing those social issues and then they publish their peer-reviewed articles. In any case we should demolish the artificial divide between so called objective research and subjectivism. There’s already so much written about how there isn’t such thing as objective research. So it is subjective, just be aware of what your bias and assumption are. Your results are biased anyways. It depends on your assumptions, where you come from, etc. And when it is clear, it’s much easier to work with somebody, a collective, a social movement, and not on them. And then finally build a society where actually everybody is a researcher and an intellectual. you make her bear three crops in a year. Can I bear three children in a year? Does she not need rest? in “The Movement of India”, News Magazine of the National Alliance of People’s Movement, special issue for the 20th Anniversary of its foundation.